The Palladium Eagle was authorized by the United States Congress by the Eagle Palladium Bullion Coin Act of 2010. This Act was signed by President Barrack Obama on December 14, 2010 to become Public Law 111-303. The Palladium Eagle coin will have the same obverse design as seen on this Mercury dime. Under the Act, the Secretary of the Treasury is required to have an independent third-party conduct a marketing study to determine if there is sufficient public demand for the United States Mint to begin producing any Palladium Eagle coins. The demand must be considered at such a level that the new program would have no net cost to the taxpayers and generate enough income to sustain itself. If those criteria are met in the study, the Treasury Secretary is required to start producing the new Eagles within one year after the study is submitted to Congress. Each coin will be struck from one ounce of .9995 palladium making a total of four different precious metal American Eagles that would be produced by the US Mint. It would join the Gold and Silver Eagles which debuted in 1986 and the Platinum Eagle which premiered in 1997. Additional specifications such as diameter and thickness are to be determined by the Treasury Secretary. The act requires that both the obverse and reverse designs contain the work of noted artist Adolph A. Weinman. 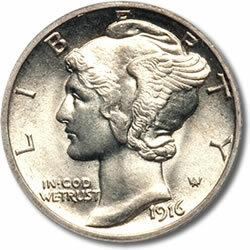 On the obverse will be a likeness of Weinman’s Winged Liberty design which many will recall appeared on the circulating Mercury silver dime from 1916-1947. The reverse will showcase a much less well-known design of Weinman’s. It appeared on the reverse of the 1907 American Institute of Architects Medal. Each strike will have a face value of $25 with the bullion coins struck at any facility other than West Point. If it is determined that Proof Palladium Eagles will be produced, they must be done so at West Point.